These homemade Larabars require only five ingredients and take only minutes to make. You’ll love the Coconut Chocolate Chip flavor! Our kitchen, in all it’s retro 1950’s glory, is slowly but surely coming together and I finally got around to using it this week. Homemade Coconut Chocolate Chip Larabars for the win! If you’ve ever had a Coconut Chocolate Chip Larabar before you’ll know it’s packed with coconut flavor and studded with sweet chocolate chips — basically a health nut’s candy bar. I think it might be my favorite Larabar flavor, although I do love Apple Pie, Peanut Butter Cookie and Peanut Butter Chocolate Chip as well. Oh, and apparently there’s a new flavor out — Strawberry Shortcake. Definitely gotta find/try that one soon. So yeah, the Coconut Chocolate Chip is a favorite and I have no clue why I haven’t made a homemade version before now. Seriously — they’re incredibly easy to make and the perfect way to satisfy a nagging sweet tooth. All you need is five simple ingredients and food processor! Make a batch this weekend and thank me later. These homemade Larabars require only five ingredients and take only minutes to make. Line a square or rectangle baking dish with parchment paper. Remove dough from processor and press evenly into your prepared dish. Make sure you press the dough down really well so that the bars stay together. 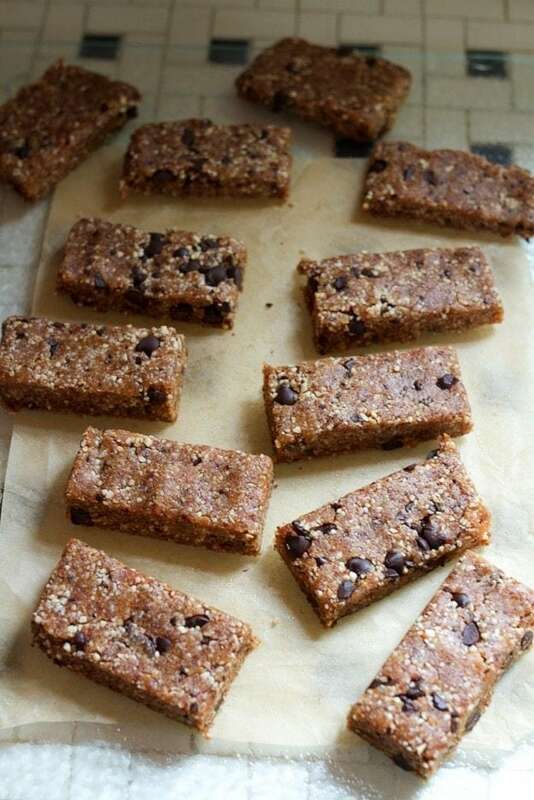 Place in the fridge for 20 minutes to harden up and then slice into bars. Store any leftovers in the fridge with parchment paper between them for up to a week. You can also store the bars in the freezer if you want them to last even longer. I can’t wait to see more photos of your house!! Once we get everything setup I’ll post some pictures! Congrats on moving in! These sound delicious – I always have a few Larabars on hand. The texture is great! These look delicious! Chocolate chips and coconut is a great combo! I definitely think walnuts instead of cashews would work! 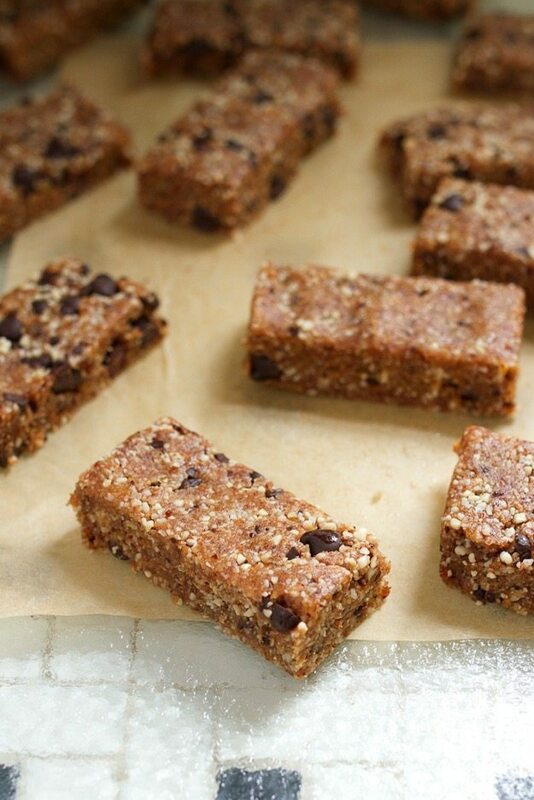 These look like the perfect on-the-go snack! I love Lara bars but don’t always want to dole out the money for them so this will be a great substitute! Simple and easy! I’m a fan of making my own Larabars too. 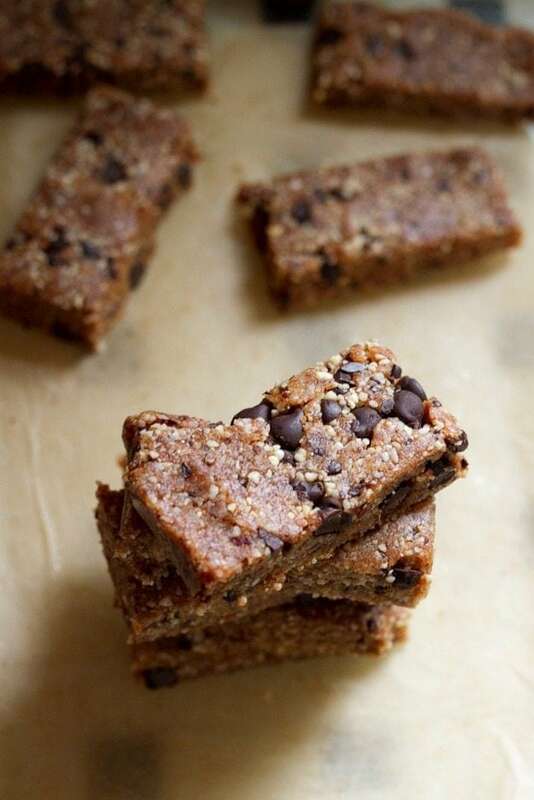 So I just made these–and they are so yummy but have question…I soaked the dates for a bit before making–so they would be easier to blend in the food processor–I also subbed cacao nibs for chocolate chips. 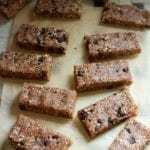 I spread the bars in my pyrex square pan–and refrigerated a while..They taste AMAZING–but are quite sticky—do you think it’s because I soaked the dates? I put the bars in the freezer now for a bit–to see if that helps!! Just wondered if you maybe knew why! Yes! Mine weren’t very sticky so I have to imagine that the extra water from soaking is what caused the sticky texture. I bet freezing them will help! these sound absolutely delicious! NEED! THEY ARE SO good–and freezer was the solution!! THANK YOU!! Can I use ninja blender as a food processor? also can I add chia seeds? What would you suggest for a net free bar like this? 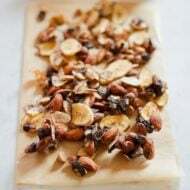 My kids cant have nuts in school and I have been looking for something like this to use as a snack. Thanks. Oh gosh! I just discovered this flavor of Lara Bars, and I am obsessed. I’ve been getting them at the local co-op this month because they’re on sale, but I will be all over this recipe when the sale ends! Thank you!! Hmmm.. That’s odd Sharon. The dates were probably just a little dry. I’d try adding some water to rehydrate the dates a bit and make the dough stick together better. Start with just a teaspoon or two and see if that helps. Getting ready to try this recipe. If it goes as easily as you describe, I add this to a new blog I am getting started. The pictures and descriptions give me the confidence to try this out. Not much of a food processor person. Have to pull it out of the original box after all these years. Follow up to my previous post. 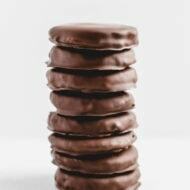 Used the food processor and have found a snack better than Girl Scout samoas. I had 1 1/4 cups of dates, so added 1/4 cup of oatmeal. Your recipe is now going to be a staple in my weekly routine. Thank you for such a delicious treat. Woo-hoo! I’m so glad you like the homemade Larabars, Bonnie. Enjoy!! I don’t know if this question will be seen but here goes. What size baking dish did you use? I’m guessing 8×8 but want to confirm. 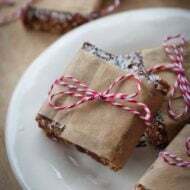 I just started making “plain” homemade larabars for my daughter and I think she’ll love this flavor! Hi Mina! I see all the comments so you never have to worry whether your question will be seen. 🙂 I used a 5X7 rectangular baking dish, but any size will work. 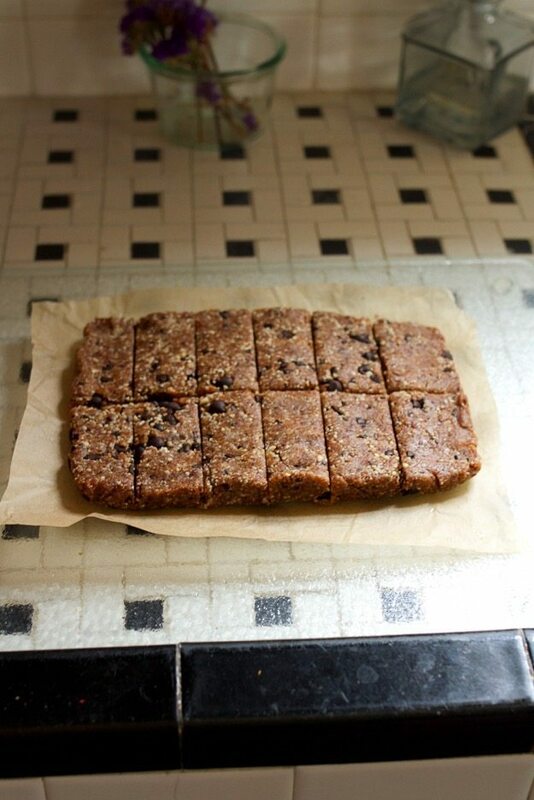 If you use an 8X8 baking dish your bars will just be a bit thinner. Hope this helps! Hi!! Curious on the nutrition counts. It what your showing per individual serving or entire batch then divded by how many pieces you would cut it into? Hi Glanna. The nutrition facts are for one bar and the whole batch makes 12 bars. 210 calories for one. Oh my! These look absolutely delicious! What can i use instead of dates? You could try using dried figs or raisins instead of the dates. Did you use the raw almonds with skin on? Yup! You can use almonds with the skin on or blanched almonds if you prefer. Did you ever try with protein powder in them to boost protein ?